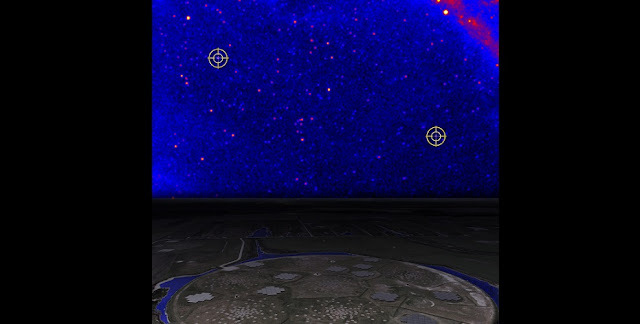 Astronomers have discovered two rapidly rotating radio pulsars with the Low-Frequency Array (LOFAR) radio telescope in the Netherlands by investigating unknown gamma-ray sources uncovered by NASA’s Fermi Gamma-ray Space Telescope. The first pulsar (PSR J1552+5437) rotates 412 times per second. The second pulsar (PSR J0952-0607) rotates 707 times per second, making it the fastest-spinning pulsar in the disk of our Galaxy and the second-fastest known spinning-pulsar overall. Pulsars are neutron stars, the remnants of massive stars that exploded as a supernova, which emit radio waves from their magnetic poles that sweep past Earth as they rotate. As a result, they act like lighthouses where we see pulses of radio emission for each rotation. Neutron stars are the size of a city packed in more mass than the Sun. That’s why they are used to study the behavior of matter under extreme densities. By studying the fastest-spinning pulsars, astronomers hope to discover more about the internal structure of neutron stars and the extremes of the Universe. Pulsars shine the brightest at low frequency radio waves and this makes LOFAR an ideal telescope for studying them. “However, finding pulsars with LOFAR is extra hard work because gas and dust between stars disrupts low frequency radio waves,” says Cees Bassa from ASTRON, the Netherlands Institute for Radio Astronomy. That’s why astronomers usually look for pulsars at higher radio frequencies. Bassa and his colleagues have now found a way to overcome this problem. “We have developed a new processing technique, which uses graphics cards (originally designed for gaming) in the large DRAGNET computer cluster in Groningen to process the LOFAR data.” This cluster is funded through an ERC starting grant to Jason Hessels from ASTRON and the University of Amsterdam. Ziggy Pleunis, working together with Bassa and Hessels, was the first to test this technique in a pilot survey with LOFAR in 2016. He struck gold finding PSR J1552+5437, a pulsar rotating once every 2.43 milliseconds or 412 times per second. This is the first pulsar spinning at millisecond spin periods found with LOFAR. “As millisecond pulsars are known to emit both high-energy gamma radiation as well as radio waves, we specifically looked at gamma-ray sources of unknown origin,” says Pleunis, now a PhD student at McGill University in Montreal, Canada. He was able to show that the gamma-rays from the millisecond pulsar arrive at the same rotational phases as the radio pulses, suggesting a common mechanism for producing both types of radiation. Spurred by the success of the pilot survey, Bassa, Hessels and Pleunis continued searching for millisecond pulsars with LOFAR and quickly found an even faster-spinning pulsar. Rotating 707 times per second, the so called PSR J0952-0607 is the fastest-spinning pulsar known in the disk of our Galaxy. Of the known pulsars, PSR J0952-0607 is surpassed in rotation speed only by a pulsar in a dense star cluster outside of the Galactic disk, which rotates 716 times per second. “Because PSR J0952-0607 is much closer to us than the pulsar in the star cluster, it allows us to study it in much more detail,” says Bassa. Using the Isaac Newton Telescope on the island of La Palma, Spain, the astronomers identified a low-mass star orbiting the pulsar, which provided additional measurements of the distance and energetics of PSR J0952-0607. Future optical observations of the binary companion star will help to determine the mass of the rapidly spinning pulsar, allowing astronomers to discern its composition. Both pulsars (J1552+5437 and J0952-0607) are unexpectedly bright at the low radio frequencies, and quickly become dimmer at higher radio frequencies. This means that they would probably not have been found at higher radio frequencies where most previous radio telescopes searched for pulsars. Hence, there may be an as-yet unseen population of fast-spinning millisecond pulsars in our Galaxy. “We are finding growing evidence that the fastest-spinning pulsars are the brightest at low radio frequencies, and that there may be a link with the production of high energy gamma-rays,” says Hessels. If this is indeed the case, then LOFAR is expected to find more, possibly even faster-spinning, millisecond pulsars whose rotation rate can give astronomers a better understanding of the internal structure of neutron stars.